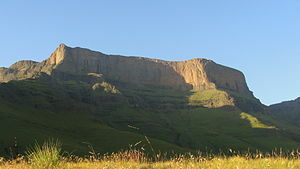 Giant's Castle is a mountain peak in the southern African Drakensberg in KwaZulu Natal. Giants Castle offers visitors to the regions hiking opportunities with panoramic views. The Nature Reserve offers secluded accommodation, bushman rock art with easy access for everyone and about the best base to start a Drakensberg hiking experience. The area is one of many of South Africa's adventure areas, and plays host to the Giants Challenge marathon in April each year. Lying at the southern end of the central Drakensberg Giant’s Castle, which gets its name from the outline of the peaks and escarpment that combine to resemble the profile of a sleeping giant, is essentially a grassy plateau that nestles among the deep valleys of this part of the Drakensberg. 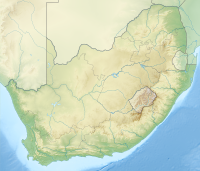 Giants Castle Game Reserve is considered the home of the eland as well as the bearded vulture. Another Giants Castle highlight is the superb bushman rock art at main caves which is easy to get to and well presented. The well known vulture hide can be booked to allow up to three photographers to observe and photograph bearded vultures and Cape vultures. It needs to be booked well in advance, especially in the busy winter and spring seasons. There are in excess of 25 walks in the Giant’s Castle Game Reserve. The 285 kilometres (177 mi) network of trails here includes 3 kilometres (1.9 mi) to 30 kilometres (19 mi) hikes, spanning from 1 hour to overnight. ^ "Corner Pass". Vertical Endeavour. ^ "You Be The Judge". Vertical Endeavour. ^ Newman, Jonathan. "I Am Crazy But I Am Not Stupid". Vertical Endeavour. ^ "Thumb Pass". Vertical Endeavour. ^ a b Newman, Jonathan. "Hlubi Passes". Vertical Endeavour. ^ Newman, Jonathan. "Langalibalele Pass". Vertical Endeavour. ^ Newman, Jonathan. "Bond Pass". Vertical Endeavour. ^ a b c "Jarateng Passes". Vertical Endeavour. ^ "Hike Report Giants Castle Giants Pass". Vertical Endeavour.